Herbal Essences' Northwest cuisine is sure to offer every individual a meal that will send them off satisfied and telling those they know of the amazing experience they had. We are located a mere block and a half from the INB Preforming Arts Center (formerly Spokane Opera House) tucked inside a gorgeous restored brick building. 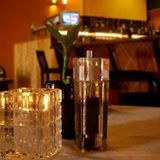 Here you'll find a warm and inviting atmosphere mixed with excellent service to ensure a nice intimate evening or a nice quick lunch on the go.